One of the biggest photography interests for the range of photographers are lakes, especially the scenic ones which are easily accessible by visitors. There are some excellent ones in Mount Rainier National Park, which are easily accessible from visitors areas (parking with a short hike) or a longer hike if you are prepared (additional information). There are currently 400 mapped lakes in Mt. Rainier NP, but less than 50 have official names listed on maps for the NP. Many of unnamed lakes are either small, remote or intermittent (seasonal or temporary) and haven't required a full identification or description in publications or on maps. The lakes in Mt. Rainier NP are divided into three catagories, two major ones and one obvious one. The first to two types of lakes are divided by their location, namely elevation, in relation to the treeline, where they are either surrounded by forests or above the treeline and are open or in geologic features such as tarns, cirques, etc. The third type are the scenic or photogenic ones, most of which are alongside roads, listed below for easier identification for location. For the photographer, the scenic or photogenic lakes are interesting for their beauty and view of Mt. Rainier as a backdrop. The hardest part of photographing them is the light and wind, the former makes the image or photo difficult and the latter may spoil any reflection. As they say in photography, it's all about light and timing, and often make multiple trips with near sunrise and sunset being the best times and light. The two other types makes for a lot of interesting photo opportunities if you want to capture more than just Mt. Rainier itself. They afford you the opportunity to capture much of its uniqueness and nature. As they say, it's in the eye of the photographer, so I invite you to visit the other lakes too, listed in the list of lakes or found on the map of lakes Web pages. There isn't much on-line or published information about the lakes in Mt. 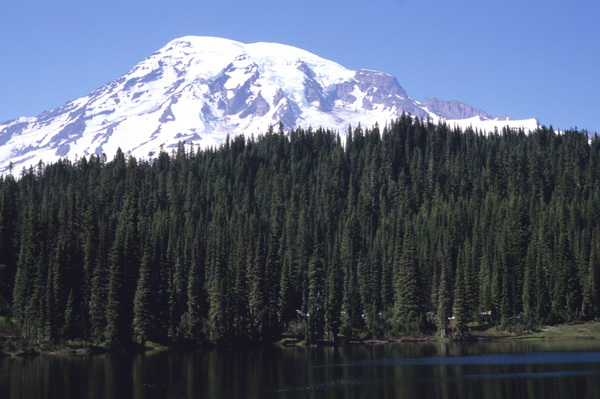 Rainier NP, and what does exist are often research studies related to water resources investigations or academic research. That said, here's a list I've found to date. Lakes of Washington State, Volume 1, Washington Department of Ecology, 1973. Water Quality of Selected Lakes in Mt Rainier NP, USGS WRI 85-4254, 1985. Water Quality and Sediment Data for Selected Lakes in National Parks, USGS Data Seres 751, 2008. I'll add to this as I find more studies or reports. Nisqually Entrance, on Highway 706 from the Nisqually Entrance to Paradise, doesn't have any lakes easily accessilble from the road or a short trail, but two lakes southeast of Paradise on the continuation of highway 706 as Stevens Canyon Road are accessible, see Ohanapecosh entrance. Ohanapecosh Entrance, on Highway 123 and Highway 706 from the along the Stevens Canyon Road to Paradise, has two lakes, Reflection Lake and Louise Lake, which are just off the highway. These are the two most photographed lakes in the NP, also in the above photograph. Carbon River Entrance, off Highway 165, has no easily accessible lakes since the entrance is closed at the NP boundary (5 miles into Ipsut Creek Campground destroyed in winter 2006 and 2008 floods). Mowich Lake Entrance, Highway 165, has two lakes, Mowich Lake with a campground and trailheads and Lake Eunice a short hike from the parking lot northwest of Mowich Lake. White River Entrance, on Highway 410 to Cayuse and Chinook Passes, has a few smaller lakes, Shallow Lake at Sunrise Visitors Center, Sunrise Lake on Palisades Lakes trail, and Tipso Lake just off Chinook Pass which are easily accessible. Above all else when visiting the lakes, please ensure your trip is safe and doesn't harm the environment. There only a few tips anyone can give you to photograph lakes, and mostly it's being there at the right time with the right weather, the old adage, "timing is everything." That timing involves the season and month, the time of day, especially around sunrise and sunset, the moon rise and set, see information, and the weather, such as cloud cover, rain or snow and the wind. The wind, or the lack of it, determines any possible reflections from the lake surface to the position of the camera. In addition, you should watch the foreground and background to frame the lake in the photograph. You should consider a range of wide angle lenses or a combination zoom to cover the range of views you can get of the lake from the different locations along with a macro lens to add the close foreground into focus. After that there are two basic suggestions, which is the old adage about location. So while staying on the trails, walk around the lake to get range of views of it with the background. This also changes the direction of light for the different times you are there or want to come back. Second, don't forget to hike above it to get overviews and photographs of it above lake level. It can give the view perspective. Remember, however, as with your hike around the lake, stay on the trails and only venture off where it's obvious you won't damage the plants. While clearly not photography, a less common activity on the lakes in Mt. Rainier is boating and fishing, and while boating seems unlikely activity do to the small size of the lakes, Mowich lake being the largest, fishing, especially fly-fishing (once a hobby of mine), can be an enjoyable way to pass the time when not engaged in photography. For both boating and fishing you can get the information and rules from the NPS Website. You can find sources for maps. Please use the contact link to send e-mail.